11 entries categorized "SCOTLAND & NORTHERN IRELAND"
NOT THE LAST ONE, BUT GETTING THERE !! 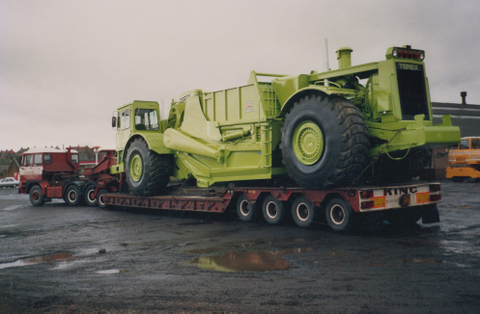 BACK IN AUGUST 2010, MR JIMMY CAMPBELL SNR OF WEST OF SCOTLAND SENT IN THE FOLLOWING SHOTS OF A TEREX R-17 THAT HIS COMPANY HAD TRANSPORTED. WE APOLOGISE FOR ONLY JUST PUBLISHING THE IMAGES. 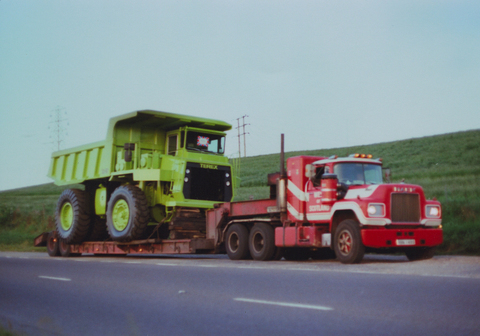 .....followed by the photos of the truck, which by the way, went into service in July 1981. The last machine of this class surprisingly went from Newhouse in in June 1987, albeit with one of the silly later series of numbers, FR011006, but the last one with a proper number, B23695, left there in June 1984. OVER THE IRISH SEA, AGAIN ! THROUGH A LUCKY COINCEDENCE, ALAN MATCHETT RECENTLY MET AN EX BH BELFAST STALWART WHO WE HADNT HEARD FROM THUS FAR ON THE BLOG, ADVISED HIM OF THE EMERGENCE OF B.H.M., AND ENCOURAGED HIM TO HAVE A LOOK AT IT. So we are very pleased to announce that Malcom Morgan, the last leading light in BH Northern Ireland, has now made contact direct, and the ex-Regional Manager has also sent us a couple of images. Now we did in fact have one of them already, but only a "fuzzy" version from BH News, but now we have an original, in all its glory, seen below. It shows Malcolm in the Middle, (US TV show for the uninitiated), Norman McBride then Parts Manager on the left, and Austin Field, (JBH Sales Director at the time ?) 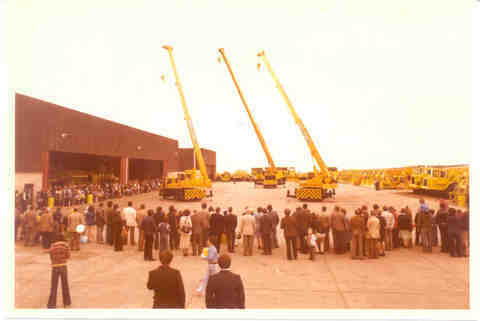 at the Belfast Show, sometime in the mid-1980`s..... ....with the content of this image, it includes a 32-04 (!!!! 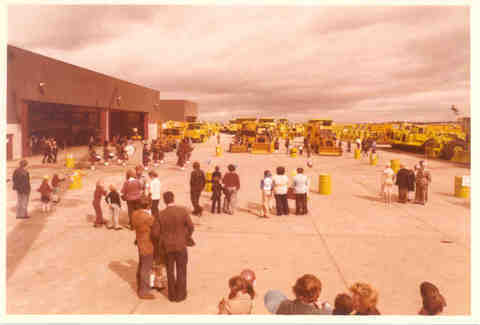 ), and R-17`s, whose respective productions started & finished around 1983/84, we would suspect that this was the date.....the second foto is a similar occasion, almost certainly later, and obviously we had new agencies in BHNI by then..................... ....although we dont see any signs up for Titleist or Top-Flite, which we would have thought appropriate, given one of the attendees !!! We have Malcolm again, on the left, in the middle John Russell, Sales Manager with Yale Lift Trucks, and of course that well known Cambridge Blue & current high flyer at the R&A, ex-JBH MD Peter Dawson. 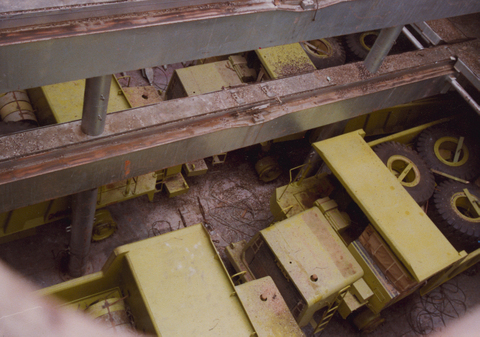 THE TEREX 90C CAME TOO LATE TO SALVAGE ANY REAL MARKET POTENTIAL IN UK FOR THAT SIZE, THE MISTAKES ON THE 72-71A & B ENGINE SIZES BEING FATAL FOR ANY REAL SERIOUS ATTEMPT AT A COMEBACK. So it is good to see at least one version still around, we estimate it is probably about 15 years old, and still in one piece and operating in Stirling. Mr Campbell`s company West of Scotland Excavations moved it only a couple of weeks ago, and although we have no detail of ownership or destination, it`s good to see the animal up & running. SOME MAY REMEMBER THE G.M. 16mm FILM (AND ALSO THE REAL THING) OF THE BURNING BING IN GOREBRIDGE, SCOTLAND, CALLED "THE STONE THAT BURNS". 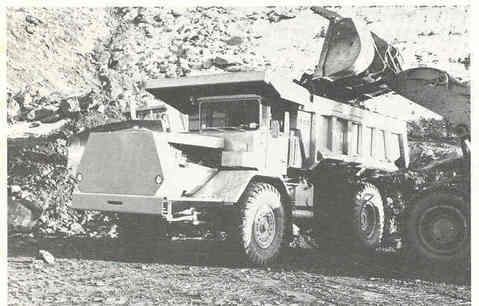 Well "White John" Robertson has come up with a photo of the site, showing a Tractor Shovel TS-24 unloading downhill on the Bing, a quite hairy driving application we would imagine !! By the way for interest, we are advised the original film still exists, although a little worn now, but we are told it could be transferred to dvd if anybody was interested enough to want a copy. Contact the Editors and we will pass on your interest to the party concerned. 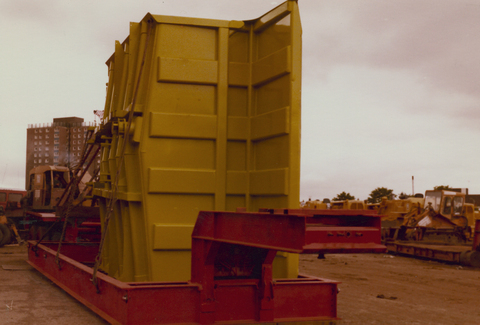 To start we have the first of only two TS-38C coal scrapers ever built being delivered to Selby perhaps (??) CEGB or Powergen we believe. 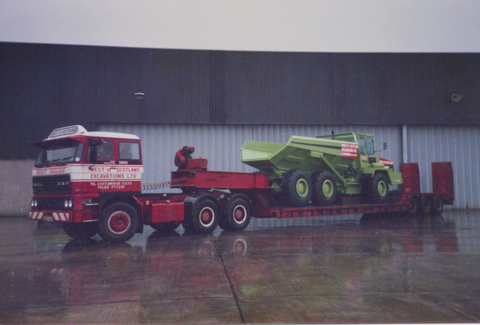 A pair of TS-24C Loadrunners were initially sold to Tarmac Construction by Goodley`s Mob in 1988/9, only to return "not wanted on voyage" a couple of years later to Barnsley (Northampton was by then housing fodder), and to be rebuilt eventually by JBH Barnsley as coal scrapers. We assume Glyn (Spider Man) Jones & Bill Proud would have been in charge of workshops then, but perhaps some of you Northern People can confirm or contest that ?? Nothing known specifically about these two images, just good to see them again, with the hilite green sparkling as it catches the rising sun coming over the mountains....err...err... sorry...err....just got carried away there for a moment. 33-09 and a pair of B10LOT`s obviously, with some nice wagons. 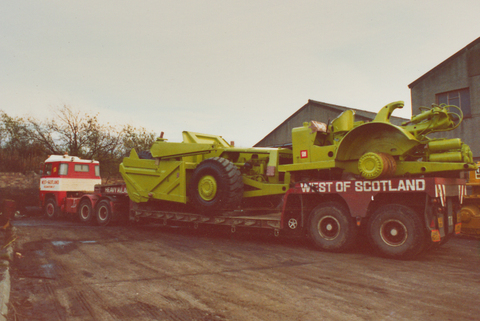 MR JIMMY CAMPBELL SNR OF WEST OF SCOTLAND EXCAVATIONS LTD, HAS MADE CONTACT AND SUPPLIED US WITH SEVERAL IMAGES OF BOTH MACHINES HIS COMPANY HAVE TRANSPORTED FOR BH OVER THE YEARS, AND ALSO SOME WHICH IS OWN COMPANY HAVE PURCHASED FOR THEIR MUCKSHIFTING CONTRACTS. SO IN NO PARTICULAR ORDER, WE GIVE YOU MR CAMPBELL`S CONTRIBUTION, WITH HSI DESCRIPTION. 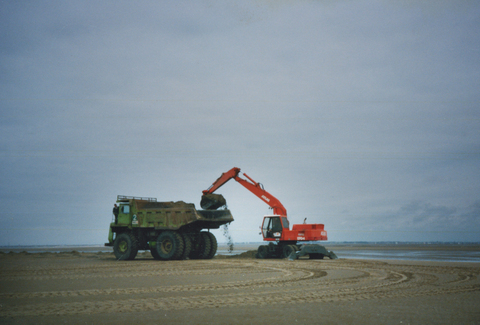 Another from the beach, with around 60 ton of sand on board. 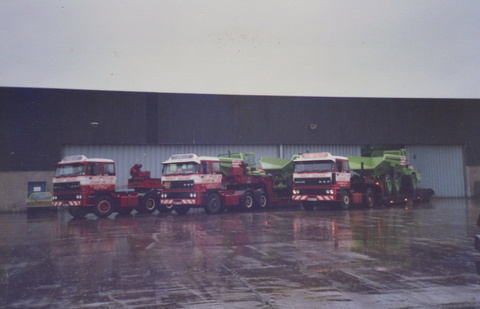 ......now something different, a photo taken of some 33-09`s coming in by ship from the Terex factory in Brazil to Glasgow Docks. The story goes that they loaded the trucks, then the hold was filled with coffee beans !! 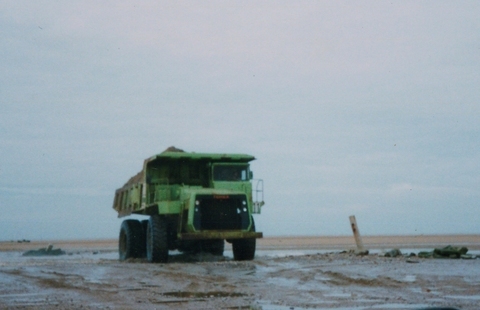 On arrival, the beans were offloaded first, and then when they took the trucks out of the hold, there were beans everywhere, aircleaners, filters, everywhere, and a load of work had to be done before they were eventually ready for work on site ! 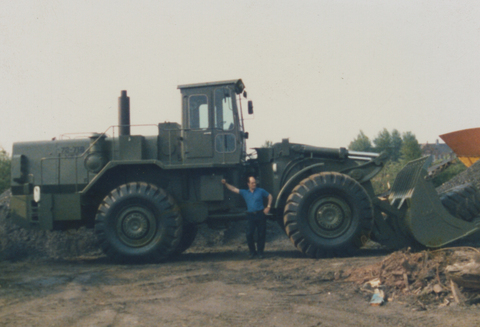 I believe that they were sold to Kier Mining, and we bought one from them many years later. YET ANOTHER SCOTSMAN CONTRIBUTES !! 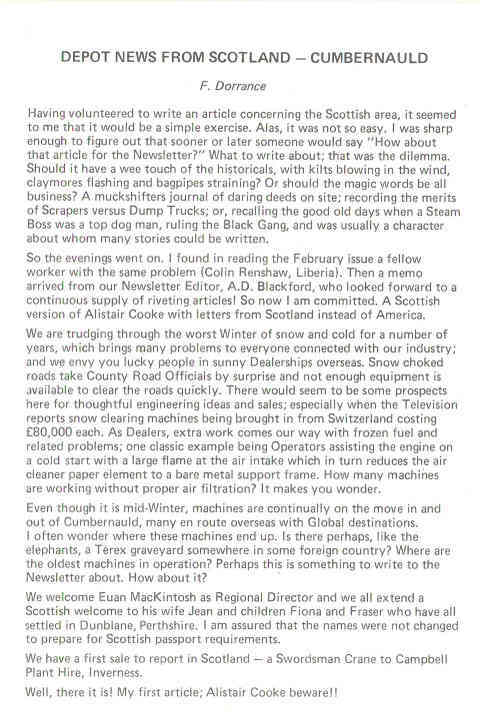 SOME LIKELY LAD FROM PATHHEAD, NEAR EDINBURGH, SENT IN A CONTRIBUTION TODAY. "WHITE JOHN" ROBERTSON HAS BROKEN HIS DUCK WITH US AND SENT IN WHAT HAS TO BE THE RAREST FOTO YET, AND IN TODAYS HEALTH & SAFETY MAD SOCIETY, IN A NEVER TO BE REPEATED SITUATION, BUT FIRST SOME QUALITY IMAGES OF CUMBERNAULD, IN ITS POMP. ...and now the special one.......how the hell did they get permission for this !! or did they !! 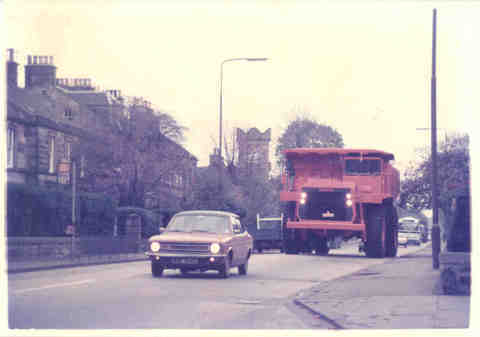 A new 33-11C, being escorted by the Morris Marina, right down Ferry Road in Edinburgh, on the way to Blindwells O.C.C.S., and according to John, if you look to the left of the photo, just behind the Marina, there is something of a tall sign near the low wall, which apparently marked (at the time) the public house owned by Ken Buchanan, that well known Scots pugilist. Trade plates & headlights, and roll it on...we like that !! 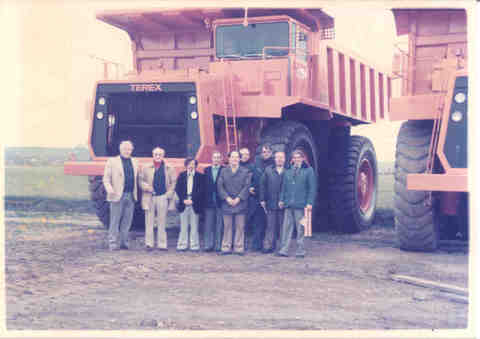 Last one is on the site at Blindwells, and John is seen posing on the very left of the group, the rest being made up of the West of Scotland Excavations delivery team, with 2 of the 3 trucks they delivered. 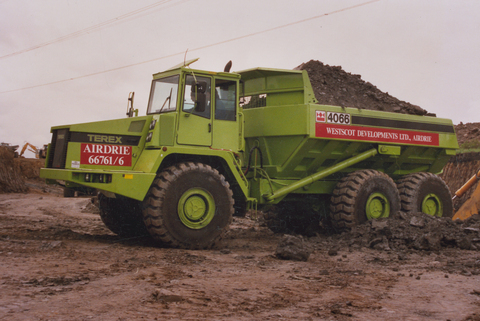 FROM BH NEWS 1979 AGAIN, A REPORT OF THE FIRST FLEET OF SIX NEW TEREX R-50B`S DELIVERED INTO SCOTLAND, SOLD TO DARNGAVIL BRICKWORKS, AN OPENCAST MINING COMPANY RUN BY `DREW ANDERSON, A MIGRANT FROM THE EAST MIDLANDS(?). FOR THOSE THAT CANNOT REMEMBER, (WHICH WE ARE SURE IS NONE OF YOU), THE R-50B WAS A SOUPED UP VERSION OF THE R-45/R-50, WHEREBY IT HAD FRONT COIL SUSPENSION INSTEAD OF LEAF SPRINGS, MUCH LIKE THE R-35B, AND IT PROVED JUST AS MUCH OF AN EARNER IN IT`S SHORTISH PRODUCTION LIFE AS ITS OLDER BRETHREN HAD BEEN, BUT WAS TRUTHFULLY BEHIND THE COMPETITION OF THE TIME IN CERTAIN WAYS, LIKE AVELING BARFORD, CAT & EUCLID, WHO HAD ALL MOVED ONTO INDEPENDENT CYLINDER TYPE SUSPENSION IN ALL 4 CORNERS SOME TIME BEFORE. 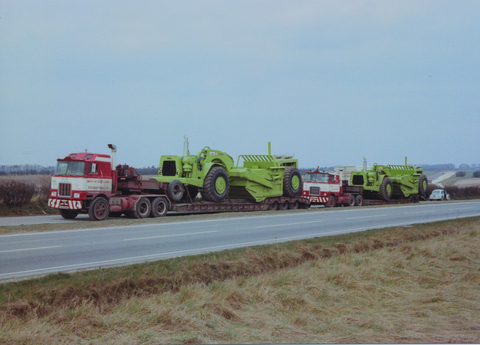 POSSIBLY EVEN THE SUCCESS OF THE R-50/50B DELAYED THE INTRODUCTION OF THE 33 SERIES INTO THE UK MARKET, WHICH HAD BEEN ON THE USA SCENE SINCE THE EARLY 1970`S IN THE FORM OF THE 33-05 & 33-07. THERE WAS EVEN CHAT AT THE TIME THAT BH HAD ASKED GM TO DO EXACTLY THAT, BUT WHETHER TRUE OR NOT, WE CAN ONLY CONJECTURE...OR DOES SOMEBODY KNOW ???? THE LAST NEW ONES WERE SOLD AS LATE AS 1984 (WE THINK), AND WIMPEYS EVEN BOUGHT SOME SEMI-REBUILDS FROM H.M.L. IN THE MID 1980`s WHEN THERE WERE NO MORE NEW ONES TO HAVE. IT WOULD BE INTERESTING TO KNOW WHO SOLD THEM TO DARNGAVIL !! 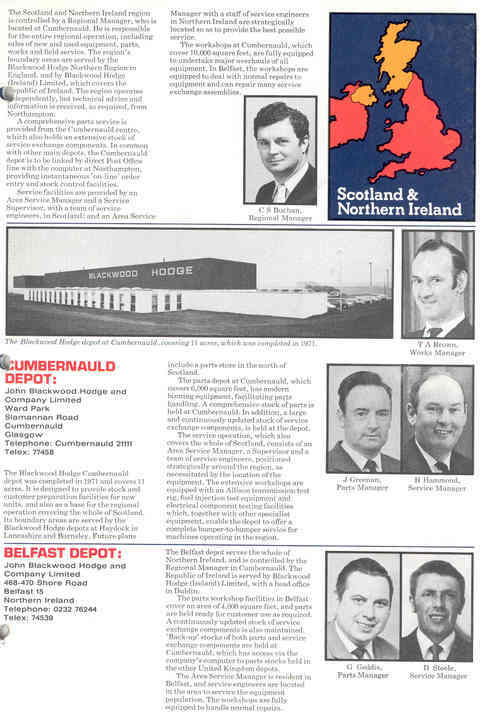 SCOTLAND/NI REGIONAL INFORMATION GLEANED FROM ONE OF JOHN COLVER`S CONTRIBUTIONS, FROM THE COMPANY`S MIDDLE/LATE 70`S UK ORGANISATION LEAFLET. WE WOULD STILL LIKE TO KNOW WHEN THIS WAS PRODUCED......FROM THE PEOPLE IN CERTAIN POSITIONS SHOWN IN EACH REGION NOW, SOMEONE OUT THERE OUGHT TO BE ABLE TO WORK OUT AND PIN DOWN THE YEAR A LITTLE MORE CLOSELY THAN WE HAVE DONE SO FAR.....CAN ANYONE HELP ? ?